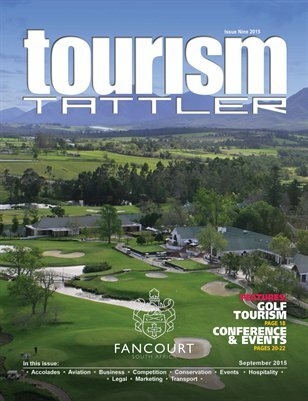 With September being Tourism Month in South Africa (and World Tourism Day on 27 September) it is appropriate that our cover sponsor, Fancourt is featured in this edition. Commemorating its 21st birthday this year (1994-2015), Fancourt has definitely come of age (read our venue review on pages 20 to 22). To celebrate Tourism Month, Tourism Tattler is auctioning 2-night fully inclusive weekend holiday vouchers for two people sharing at selected luxury Mantis Group properties in South Africa (read more on pages 24 to 27). In this edition, we look at the viability of Golf Estates in Africa (page 18), and South Africa’s low domestic airfare prices (page 10). Linked to the subject of aviation is SATSA’s Market Intelligence Report, which provides the latest tourist arrival statistics, hotel room rates and car rental data for South Africa (page 12).